As the first Eco-mall in Singapore, City Square Mall will be joining the hundreds of millions across the globe to celebrate World Environment Day on 6 June 2015 by holding a myriad of activities such as an eco-exhibition, workshops and stage games, as part of the mall’s commitment to environmental sustainability, to raise the community awareness on environmental issues as well as educate the public on the importance of water conservation and how it directly affects energy consumption. 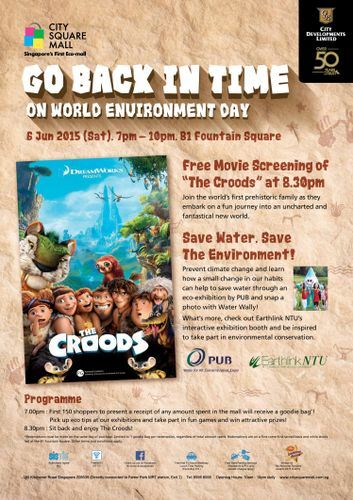 At 8.30pm, families will be treated to an outdoor screening of The Croods. Journey with The Croods as they discover new technologies and the importance of family, love and kinship, in a time before the advent of electricity.